As it is now officially spring, I have been really craving my beloved thai spring rolls. It is my favorite appetizer at Thai restaurants, but I actually prefer to make them myself. As it is getting warmer and sunnier outside, these spring rolls are such a great light lunch idea. They are so quickly prepared, and you need no fancy equipment or ingredients to make them. I know that many of the recipes on my blog can be quite pricy, but this one definitely falls under the „eating on a budget“ category. All you need are some raw veggies of your choice, rice paper and rice noodles which you can already get for one or two Euros at Asian supermarkets, peanut or any kind of nut butter and some condiments that you probably already have in stock. Summer rolls are also a great work lunch, because you eat them cold, and you can prepare them the night before. The peanut dipping sauce is also divine. Even though I have switched from peanut butter to almond butter a long time ago, this peanut sauce will really blow your mind. It is so creamy and delicious, packed with healthy protein and fats, and really gives this recipe a special touch. I know that many of you are allergic to peanuts, which is why I am working on a second dipping sauce without any kind of nuts in it. I will share the recipe with you as soon as I declare it approved. 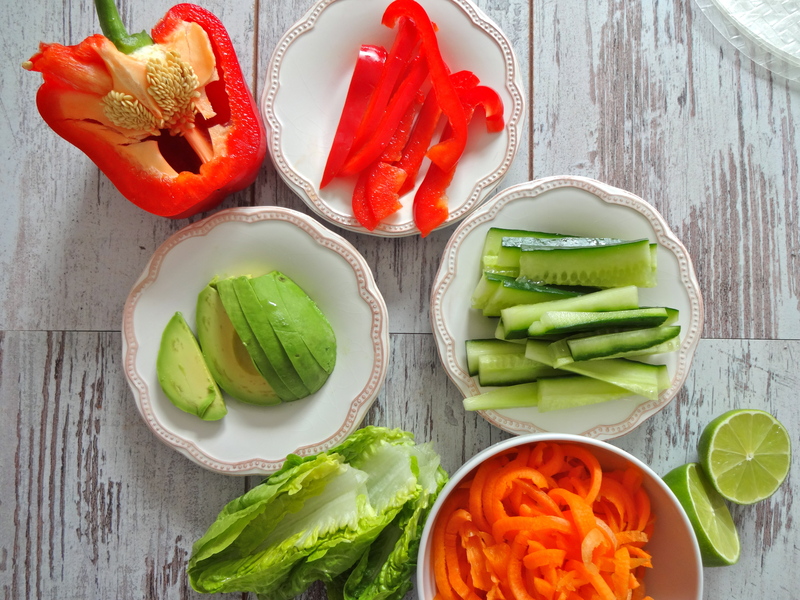 To make the wraps: cut all the veggies into thin strips or use a spiralizer to make them even thinner. Put the rice paper sheets, one at a time, in warm water so they soften. Then place them on a large plate and carefully dry them with a kitchen towel. Arrange your fillings in the middle of the paper and sprinkle 1 tsp of the peanut sauce over the veggies. Fold over two ends, then wrap it up like a burrito, making it as tight as possible. It took me a while to get a hang of it, so keep trying. Here are some pictures to help you with the technique, but just to clarify, I am not really good at it either. These look great! So fresh and tasty..
I’m so glad you like the spring rolls! I’ve literally eaten for 4 days straight because they are so fresh and healthy. You should definitely try them. Have a wonderful day! Do you add bean sprouts? They are in one of the pictures but not the recipe. They might be a nice addition. So delicious! These rolls and some Thai soup was our meal for New Year’s Eve. Great way to end the year!